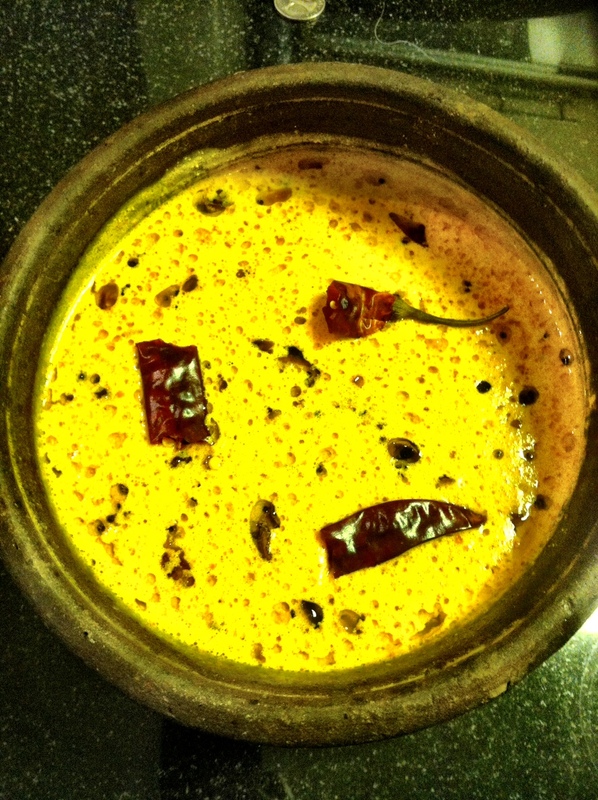 Moru Curry or Moru Kaallan is almost everyone’s favorite and is traditionally made in Kerala. It’s a must curry in almost all our feasts. Have it with Kuthari choru/Kerala’s traditional red rice. Grind curd, coconut, cumin and shallots into a fine paste. Mash the curd and mix it with the coconut paste. Keep it aside. Peel and cut the Kumbalanga / Ashgourd into small cubes. Cook Ashgourd with 2 cups of water, turmeric powder, chilly powder and salt. Ashgourd cooks quickly and hence ensure not to overcook it. Cook it over a low flame. Once the Ashgourd is cooked well add the coconut and curd paste to this and keep it in low flame untill hot. Take care, the curry should not boil. Remove from heat. For seasoning, heat coconut oil in a pan (over medium flame), add the mustard seeds, once spluttering is complete, add red chillies and curry leaves. Turn off the flame. Keep it for 1 minute and then pour to the curry.